1. Pound the sage, rosemary, oregano and fennel seeds in a large pestle and mortar (or pulse in the small bowl of a food processor), then mix with the salt, sugar and plenty of ground black pepper. Tip into the base of a small roasting tin. Remove any string from the pork and pat all over with the herb cure, making sure it’s evenly coated. Sit the pork in the tin, cover with cling fi lm and chill overnight. 2. The next day, preheat the oven to 150°C, gas mark 2. Thoroughly rinse the cure off the pork and pat dry with kitchen paper. Rinse out the roasting tin, then return the pork. Cover the tin tightly with foil and roast for 2 hours. Uncover, baste in the cooking juices, then cover and cook for a further 1½ hours. 3. Turn the oven up to 200°C, gas mark 6. Remove the tin from the oven and transfer the pork to a separate foil-lined baking tray (keep the tin with the juices as you’ll use them later); roast uncovered for a fi nal 30 minutes to crisp up the fat. Take out of the oven and rest for 30 minutes, loosely covered with foil. 4. While the pork is resting, make the slaw. Slice the fennel as fi nely as possible (use a mandoline if you have one) and put in a bowl of iced water for 10 minutes to crisp up. In a mixing bowl, whisk 2 tbsp of the pork cooking juices with the oil, mustard, lemon zest and juice. Thoroughly drain the fennel, then toss into the dressing with the apple and chives. 5. Place the roasting tin of cooking juices on the hob and simmer until just turning syrupy. Shred the pork with 2 forks, then toss into the cooking juices, turning until evenly coated. 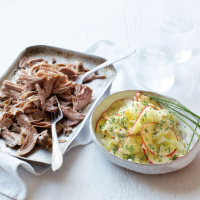 Serve the pork and slaw together, plated or in buns, if liked.